Goomtee Tea Garden is located near Kurseong in Darjeeling district and next to the National Highway (Hill Cart Road) that leads all the way to Darjeeling hill town. Out of about 225 hectares of gross estate area, about 50% is used for tea plantation. This is an organic tea garden which means that no chemicals or pesticides are used in growing the tea bushes. 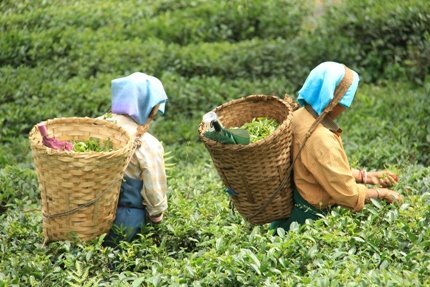 The estate produces one of the finest quality of orthodox Darjeeling tea and employs over 300 garden workers. The estate was set up by a British planter Henry Montgomery Lennox. The Goomtee Bungalow is located within the estate property at an altitude of 4,150ft and having stunning view of mountains and valleys all around. It used to be Henry's family residence and is now over 100 years old. After the Kejriwal and Prasad families had jointly taken over the property in 1956, this old bungalow has been revamped over time. But they have retained the original colonial charm and the aura. The new owners have been using the bungalow to accommodate the group's visiting directors & their families. However they have now opened it to the tourists as well. Known as the Bara Bungalow, it is a well maintained heritage building. It has four large double rooms with attached baths. 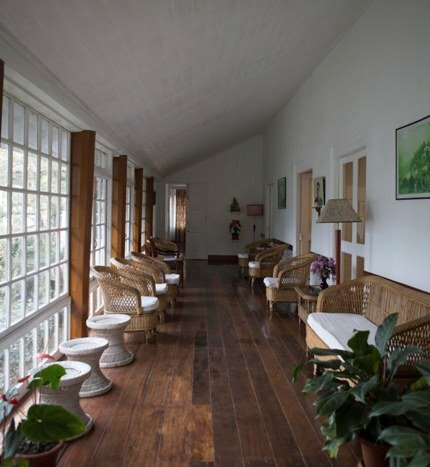 All the rooms have wooden floors and ceilings, and some with wood paneled walls giving warm and cozy feeling. 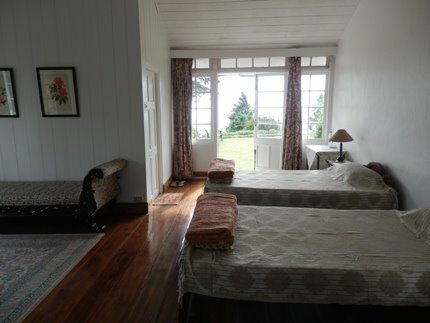 The rooms have king size beds, wicker sofas, small bedside carpets, and simple wooden furnishing. There are no TVs in the rooms. The bathrooms are quite modern. Hot water is available all the time. The management also ensures 24-hours electricity and security in the bungalow. All the rooms have great views through the picture windows. Other than mountain range and valleys, the rooms and the adjoining lawns offer lot more scenic views. Towards north you will see Pine trees, Camellia and Jungpana Tea Garden, towards south there is a lush garden, bougainvillea, and a hill covered with azalea, towards east there is a lawn, bamboo grove, and you can see sparkling Siliguri lights down below at night, and towards west is lovely garden full of roses, jasmine, magnolia, and the Goomtee tea processing factory. There is a common living room that has sofas, center table and a fireplace. There is a TV here that runs the standard satellite channels. 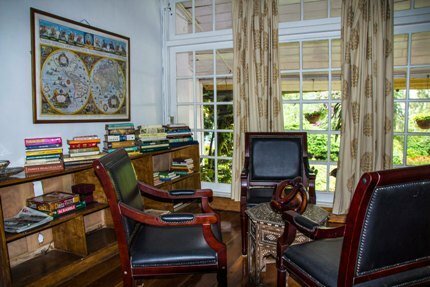 There is also a small library tucked in a corner of the living room with a cabinet full of books on travel, history, Buddhism, tea, yoga, health, gardening etc. The library also has its own little seating arrangement with cushioned cane chairs. There is a dining room with wooden floor. Few tables are spread out seating six each. Food served is mainly vegetarian although they do offer eggs and milk products. Chefs prepare different types of vegetarian cuisine including north & south Indian, Continental, Chinese, American dishes etc. Bottled water is served. They serve fresh tea everyday in the morning which is harvested in the previous day from their gardens. While there is no bar, they can arrange for drinks at extra cost. Other services in the Goomtee resort includes laundry, fireplace lit up during winter, room heaters etc. There is provision for drivers accommodation and food as well (at an extra cost). A telephone is made available for making local calls in the Darjeeling district area. 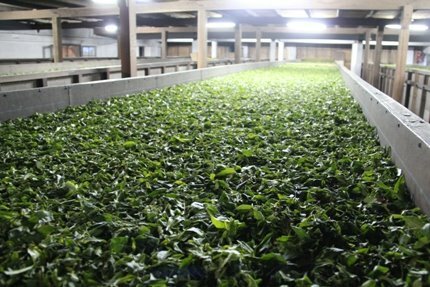 Visit the gardens, chat with the garden workers followed by a visit to the Goomtee factory where you will see live tea processing through all the stages including the final packaging. Go through a tea tasting session where a staff will explain you how they grade the teas, the concept of flush, how the valuation of tea is done and many other interesting things. You can also buy tea of your choice from the factory outlet and get 15% discount on the market price. They can arrange for a picnic lunch. If you tell them in advance, they can arrange for a trip to Tiger Hill for a sunrise view early in the morning. Take the toy train to Kurseong and back, or take a day trip to Darjeeling. Take a guided hike in the surrounding area walking through the villages and in abundance of nature. They can organize Gorkha dance & music in the evening performed by the local villagers. Table Tennis and board games are available. 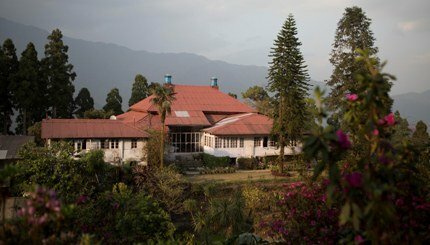 Goomtee Tea Estate is almost midway between Siliguri and Darjeeling hill town and near Kurseong. It's 40kms from Siliguri, 48kms from Darjeeling and only 8kms below Kurseong. From the Hill Cart Road, one needs to take the approach road at Mahanadi Toy Train station and go only for about 100 meters to reach the Goomtee Resort. Cost includes vegetarian meals and a Darjeeling tea. During winter, they will light up the fireplaces at night. All other costs are extra including transport, factory visits, sightseeing etc.